Our custom made Go/No-Go tapes may have one or more sets of A B C dimensions on one tape. Anytime "0" line falls between A B C lines, part is within tolerance. The minimum diameter distance between lines is .004" (.12mm). The standard diameter inch Go/No-Go tape gage member width is 1/4". We also offer tapes with gage member widths of 1/8", 3/16", 3/8" or 1/2". The standard thickness of the material is .010" on most sizes. The standard metric Go/No-Go diameter tape gage member width is 6.35mm. 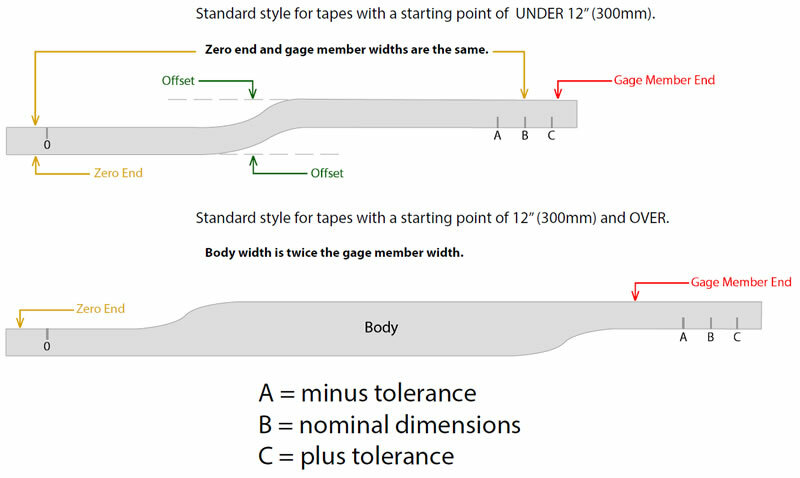 We also offer tapes with gage member widths of 4.76mm, 9.53mm or 12.70mm. The standard thickness of the material is 0.25mm on most sizes. Pi Tape can manufacture precision special made tapes specific to your application. Specialty sizes, widths and thicknesses are available upon request. Please email your custom tape order with any questions, prints and/or diagrams to quotes@pitape.com.